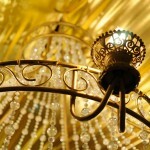 For a more dramatic, inviting, and better lit space, accent lighting is the obvious choice. Accent lighting is perfect for closets, reading, highlighting artwork and illuminating display shelves. This project is not as daunting as it sounds; you should be able to finish this project in just two weekends! You will need a circular saw, 4-ft. Level, screw fun, miter saw, and a jigsaw. Be sure to get an electrical permit before you begin this project. 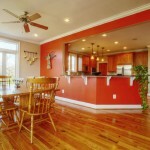 If you are unsure about DIY wiring and electrical, hire an electrician. Soffits can be taller or wider to suit the specific size of your room, you likely need to have a 28-in. wide soffit however, because the lights need to be far enough away from the walls to light things properly. 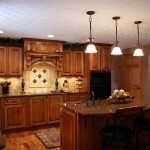 You can have recessed lighting, rope lighting, or both. Draw a blueprint of where everything will go (soffit measurements, light placement, wires, switches, etc.). Mark the location of the joists for your soffit frame, finding these with a stud-finder. Use a snap-chalk line for improved accuracy, marking 22-1/2 in. away from walls that are parallel to the joists, and 24 in. from walls that are perpendicular to joists. Mark the location a foot down the wall where you intend to put a light, and come up with a wiring plan (this is when you’ll get a permit). When purchasing your materials, you will need CDX plywood (5/8-in. thick), drywall (1/2-in. thick), drywall edging (“tear away”), enough 2x4s to line the 4 walls, and 1 8-ft. Pine. Also buy a pound of drywall screws (3-in. long), 16d nails, screws (1-1/4 and 1-5/8 in.) as well as fasteners, you will need taping compound (1 gallon) and a roll of tape. If you will be trimming your soffit you will need supplies for that too. The walls in which the joists are perpendicular require a different method of framing than the walls which are parallel. For perpendicular: secure a 2×2 to the line which is 24-in. from the wall. You can use a table saw to turn 2x4s into 2x2s if you prefer. For parallel: screw blocks of 2×4 to joists in ceiling, nailing 2×2 into the ends. Your sheets of drywall need to become two parts, 8 in. wide for the face, and 28-1/2 for the bottom (dependent upon your scale for the size of your room). Be sure to check that your ceiling is level, and accommodate if it is not. If your work is level so far, put in the rest of the screws, spaced 6 in. apart. Add the lookouts and 2×2’s to the lower edge of the plywood. You’ll need to look elsewhere on the net for instructions on how to install boxes and make wiring connections, for the purposes of this article, we’ll only be describing how to run and route the cable. Make holes for switch boxes and behind the soffit above the initial holes. Leaving a minimum of 2 ft. of cable between lights is essential to this project. Feed the cable through the hole and out the box hole; staple the cable every 2 ft. (to the 2×4 ledger) while feeding it through each light location. Cut at each light, leave lots of excess cable for wiring later on. Choose a location for the duplex outlet (for your rope lights). This hole will be cut underneath the soffit (above the 2×2) using a jigsaw. Run cable from the outlet to the switch box. Lodge each lookout into its place, checking to make sure the string fits before nailing it down. Lookouts must be at least 6-in. away from each light, and should be 2-3-ft. apart. Drywall each of your soffit faces. Screw plywood to the bottom of the soffit box. Cut the holes for your lights. With your drywall’s cut edge facing the wall, screw it into the plywood (leave a ¼-in. gap). Scoring your drywall is essential all the way down the soffit face. Snap the piece and finish the cut from the underside. Use the template that came with your lights for your mounting holes. Mount them, then cut them. Install your tear-away edging, stapling ever 4 inches. Using a putty knife, fill it in with compound. Make sure you’ve applied at least 2 coats (let it dry completely in between). Tape joints and fill screw holes too, tear off and sand your flange (as well as the joints) before painting. When you’ve finished painting you can add a trim if you like. The easiest lights to use are “remodeling” lights. Get ones which are six inches in diameter. Eyeball rings are multi-purpose because you can move them around and aim them at your artwork, etc. For artwork, or special “highlighting” use spot lights, otherwise use flood (great for your closet). Install your fixtures based on the instructions that come with the lights. Anchor them with flanges that lock. Use electrical connectors to join the wires together and reclose the electrical box. Install (and wire) the wall switches, and rope outlets, inserting remodeling boxes when you need to. Screw your bulbs in and insert the trim rings that you’ve chosen. Install your rope lights (filling the soffit perimeter), then plug it in!